Carrots? Bet your mother told you that eating carrots would keep your eyesight bright. Usually we associate carrots with the colour orange but on the contrary, carrots grow in a host of other colours including white, yellow, red, or purple, the latter being the colour of the original variety. The carrot is a plant with a thick, fleshy, deeply coloured root, which grows underground, and feathery green leaves that emerge above ground. Carrots are related to parsnips, fennel caraway, cumin and dill. Carrots can be as small as two inches or as long as two feet. They can range in diameter from one-half of an inch to over two inches. Carrot roots have a crunchy texture along with a sweet and minty fragrant taste. Carrots can be traced back thousands of years to having been cultivated in Middle Eastern countries. The original carrots looked different from those that we are familiar with today. They were a deep purple colour, ranging from lavender to deep eggplant. Easy to pack and perfect as crudités for your favourite dip, the crunchy texture and sweet taste of carrots is popular among both adults and children. Carrots are an excellent source of antioxidants. They are also the richest vegetable source of the pro-vitamin A carotenes. Carrots’ antioxidant compounds help protect against cardiovascular disease and cancer and also promote good vision, especially night vision. Incorporating carrots in your diet may be beneficial to blood sugar regulation. Research has suggested that physiological levels, as well as dietary intake, of carotenoids may be inversely associated with insulin resistance and high blood sugar levels. Look for firm, smooth, relatively straight and bright in colour. The deeper the orange-colour, the more beta-carotene is present in the carrot. Avoid carrots that are excessively cracked or forked as well as those that are limp or rubbery. If the green tops are attached, they should be brightly colored, feathery and not wilted. Since the sugars are concentrated in the carrots’ core, generally those with larger diameters will have a larger core and therefore be sweeter. Carrots are hardy vegetables that will keep longer than many others if stored properly. The trick to preserving the freshness of carrots is to minimize the amount of moisture they lose. To do this, make sure to store them in the coolest part of the refrigerator in a plastic bag or wrapped in a paper towel, which will reduce the amount of condensation that is able to form. They should be able to keep fresh for about two weeks. Carrots should also be stored away from apples, pears, potatoes and other fruits and vegetables that produce ethylene gas since it will cause them to become bitter. 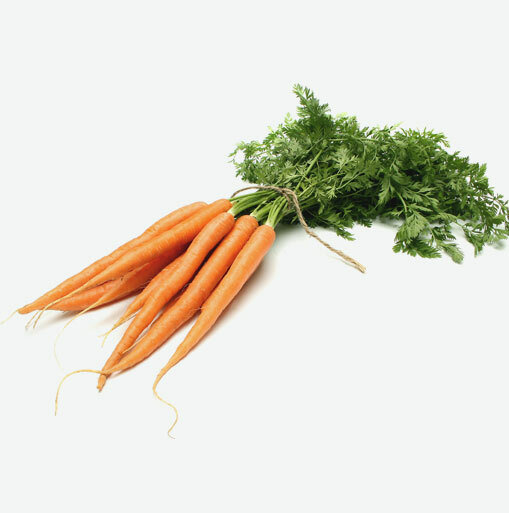 If you purchase carrot roots with attached green tops, the tops should be cut off before storing in the refrigerator since they will cause the carrots to wilt prematurely as they pull moisture from the roots. While the tops can be stored in the refrigerator, kept moist by being wrapped in a damp paper, they should really be used soon after purchase since they are fragile and will quickly begin to wilt. Wash carrots and gently scrub them with a vegetable brush right before eating. Unless the carrots are old or thick you don’t have to peel them. Just use a vegetable scrubber under cool running water. If the stem end is green, cut this away because it will be bitter. Depending upon the recipe or your personal preference, carrots can be left whole or julienned, grated, shredded or sliced into sticks or rounds. Carrots are delicious eaten raw or cooked. Beta-carotene is not destroyed by cooking; in fact, cooking breaks down the fiber, making this nutrient and carrots’ sugars more available, thus also making them taste sweeter. Take care not to overcook carrots, however, to ensure that they retain their maximum flavour and nutritional content. Shredded raw carrots and chopped carrot greens make great additions to salads. Combine shredded carrots, beets and apples, and eat as a salad. For quick, nutritious soups that can be served hot or cold, purée boiled carrots and potatoes in a blender or food processor, and add herbs and spices to taste. Combine freshly squeezed carrot juice with rice milk and bananas to make a nutrient-dense breakfast shake.